This is one of our favorite ‘Tex-Mex’ Casseroles! It is easy and a great one to prep ahead of time! I remember when my little ones were babies and having a list of recipes that I could prep during nap time then just pop in the oven at dinner time. This is one of THOSE recipes! It is fabulous right out of the oven, but oh man, the leftovers the next day are EVEN BETTER! For the salsa, we use a very mild salsa, to make it kid friendly but it is totally up to your heat preference! If you like Tex-Mex, give this one a try! Brown ground beef in skillet. Drain. Add in the corn, chunky salsa and all but 2 TBSP of the black olives. Continue cooking for a couple of minutes until mixture is warmed through. Remove from heat and set aside. Combine cottage cheese and sour cream. In a 2 quart Pam sprayed casserole dish. Layer 1/2 the crushed chips, then 1/2 the meat mixture, then 3/4 cup cheddar cheese and finally, 1/2 the Cottage Cheese mixture. Repeat the layers again ending with the Cottage cheese mixture. Cover with foil and bake in preheated 350 degree oven for 30 minutes. Remove foil. Top with remaining cheddar cheese, tomatoes, black olives, bell pepper and line the outside with whole tortilla chips. Place back in the oven, uncovered, for 2 minutes or until cheese is melted. (Careful not to let chips burn) Remove from oven and allow to set for 10 minutes. Garnish with green onions and serve! 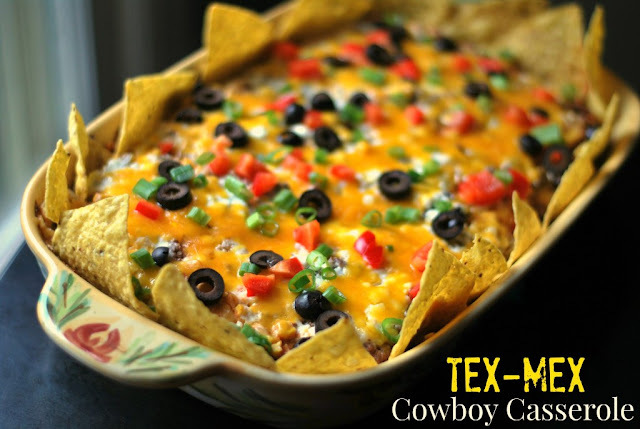 0 Response to "TEX-MEX ‘COWBOY’ CASSEROLE"